Hike over Black Cross Butte and roller coaster it over to and up Peak 3042. The peak offers rare views of the Salt River Canyon. Return the same route or perhaps take the drainage back. The entire hike is off-trail. Surface varies but is easy travel for the most part. Moderately steep terrain is encountered but it's short and over quick. Study the map. Next read Black Cross Butte 3351 for tips on attaining the major obstacle being the butte itself. I varied the course on my route up this time. It's not necessary to go over the butte as it's possible to skirt the upper slopes. However I think it's easier on the ankles just going over. From BCB you'll need to do one of two things. Either load up the route into your GPS or be a good map reader. I believe the route I've posted on the map is the best route. You could make it shorter. Just keep in mind what you make up in distance you'll end up paying for in elevation changes. The terrain is very deceiving in the middle part of the hike. I've always heard about how to be careful in the Superstitions. Heck there's very distinctive landmarks in the Superstitions from what I've experienced. This area is more of a concern in my opinion. It's like walking on top of a maze but you're not quite high enough to see where the ridges and valleys go. The buttes and other landmarks aren't distinctive enough to get depth perception either. It all kind of blends in together. Cairns guide you halfway. The second half was cairn free as of this writing. There are a few ten to twenty foot sections of path in some of the grassy sections. That aside the second half is very well preserved. You are far from being the first person to travel the area but it has a pristine pioneer feel. Peak 3042 looks tough to negotiate. I assure you it's much easier than it looks if you follow the map. Once on top of the peak you are rewarded with outstanding views of the Salt River Canyon. Circle the edge to get in all the views. 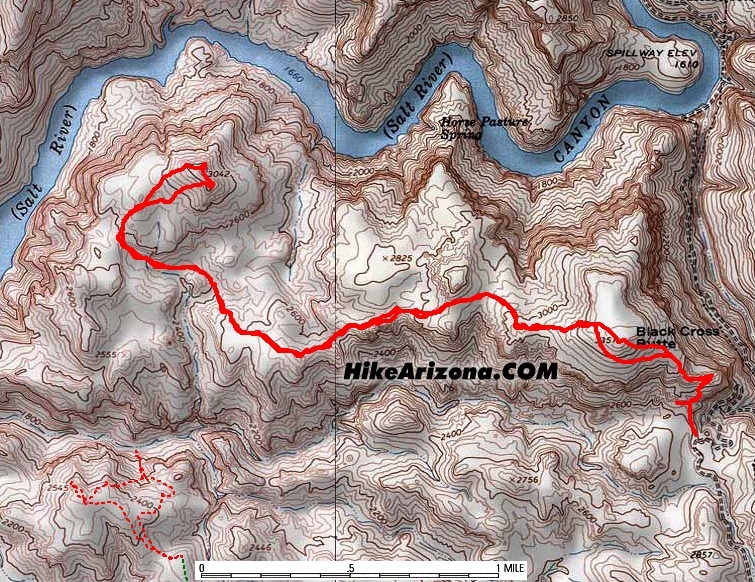 Be sure to check out the head on overview of Blue Tank Canyon. That alone was worth the hike in my opinion. Then again the route itself is pretty awesome for a day hike! I strongly advise leaving the dogs at home for this hike. There's simply too many prickly cholla balls. On my first attempt I wore teva sandals. It's possible like nearly every other hike I've done but boots are really preferred for this terrain. On a cool, breezy eighty degree day in October I downed a full hundred ounce water pack. Don't let the 451 foot elevation gain deceive you. The accumulated gain for this hike is over 2800 feet. That's not too rough in itself but if you get off course it could get ugly.